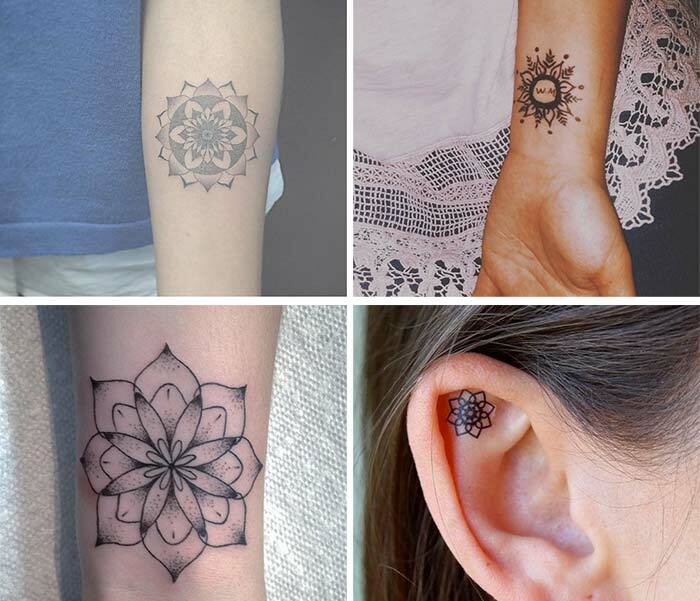 Cute small tattoos for girls can rightly be considered unique accessories, while also being brilliant self-expression means telling a lot about the personality and the inner world of the wearer. 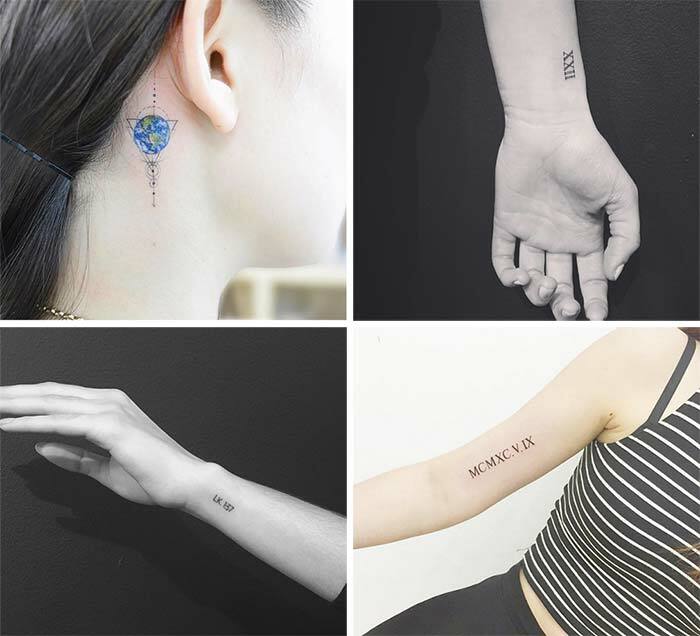 Tiny tattoos are also a great idea to start your journey in the epic world of ink with, where getting in the grip of an obsession with all those beautiful, little stamps is inevitable. 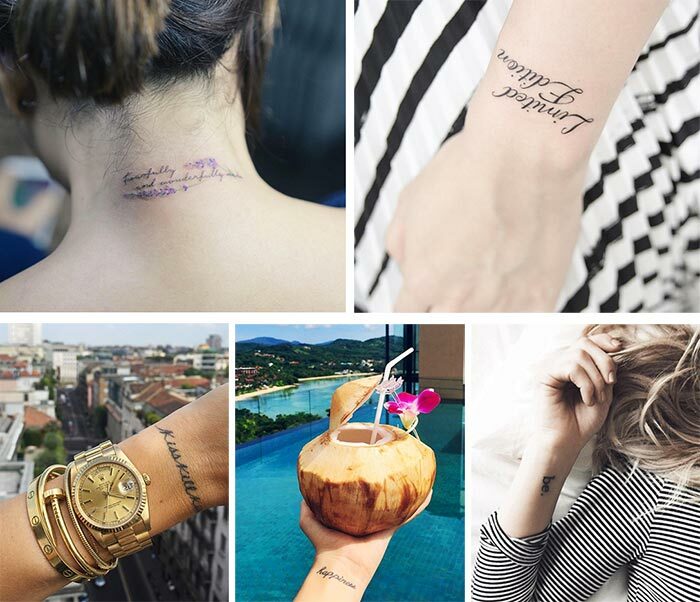 Below, we present 50+ undeniably cute small tattoo ideas for girls along with their meaning to inspire you! There is one beauty enhancement method (for some others beauty spoiling method, though) that just requires thinking twice even thrice before trying it on yourself. What is that permanently imprints a life episode, an elemental force, a religious motif, a life-leading slogan or something pretty occurring in the nature? It’s enough to hint that the very imprinting area is your own body and you will seize that it is all about tattoos. Whether you are for or against it, tattooing carries on being the center of hot debates throughout the years. Even now that we have ushered into the 21st century, where liberalism is on top, a group of people stand as vociferous opponents of body tattooing, considering them being either body distortion or a symbol of immorality. However, a large group of people, including celebrities, businessmen, scientists, even spiritual fathers have literally run mad after tattoos. Tattooing is a branch of art, a way of self-expression, something that allows flights of fancy to play around. Have you ever asked yourself what meaning that tiny and fragile butterfly inked somewhere on the shoulder or the hip of a girl carries? Are you persistently keeping the meaning of that tiny lotus flower tattoo behind the door, so mysteriously peeping out on your back while wearing an open-back design dress? 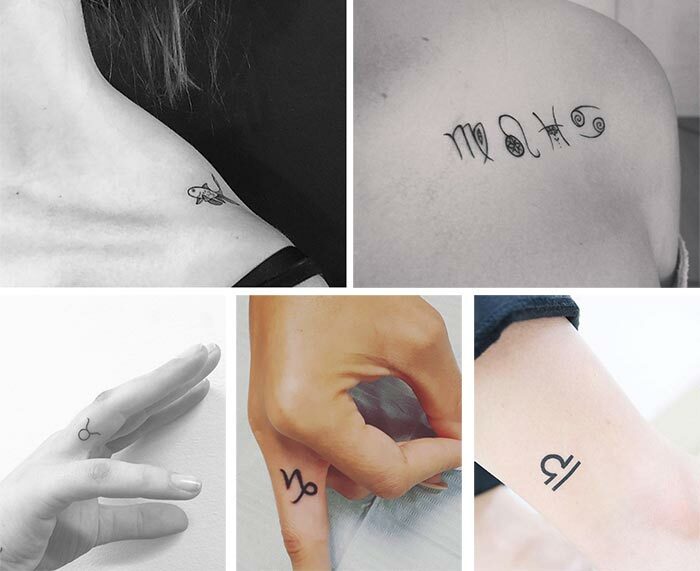 We are bringing to light a huge number of absolutely cute small tattoos for women and their meanings, which will come in handy for the first group, while enraging the second group of secret-keepers. There is still another third group actively pondering on what tiny stamp to bring unto the body. 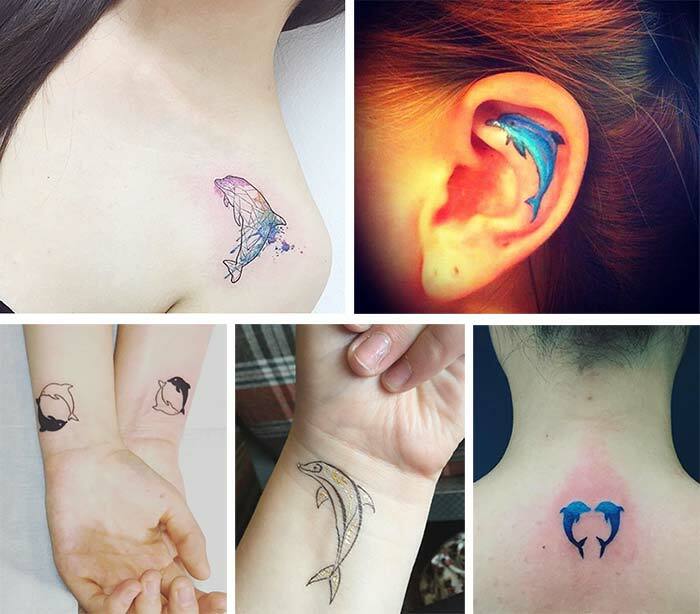 Cute small tattoos to saturation! To make a declaration of love to a woman, a bouquet of roses seems to prove the best choice ever. They are truly beautiful, with intricately layered petals and delicious aroma spreading around. 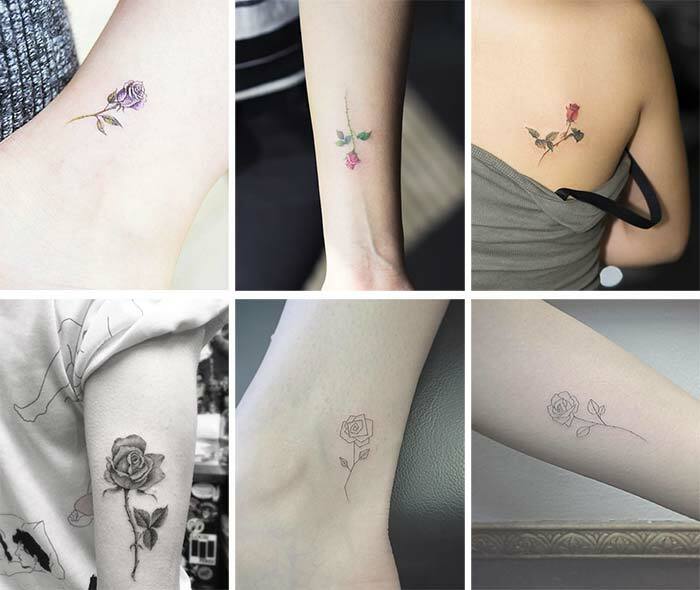 A small rose tattooed anywhere on a feminine body magnifies its beauty and allure. But the meaning of rose tattoos goes far beyond being just a beauty and love symbol. A blooming rose may epitomize love at its zenith, while a rose bud ” a newly growing love or else in anticipation to open the heart to that feeling. A rose tattoo with thorns may serve as a reminiscence of love being full of pains and struggles. Even larger symbolism comes into view when running into a colored rose tattoo. Red rose is a synonym of passionate love, pink roses are reflecting first love and innocence, and yellow roses are a symbol of friendship, joy and in some cases also mature love. There also occur white rose tattoos as a reference to purity and a secret admirer, and blue roses mirroring something beyond reach. A black rose may be inked on body as a memory to someone special or to something mournful. Maybe we haven’t yet revealed the secret behind your rose tattoo, yours is purple! It is already revealed. Purple rose is a symbol of true eternal love or love at first sight. From egg to caterpillar to chrysalis and finally to awe-inspiring butterfly ” these are the metamorphosis phases of this stunning insect. 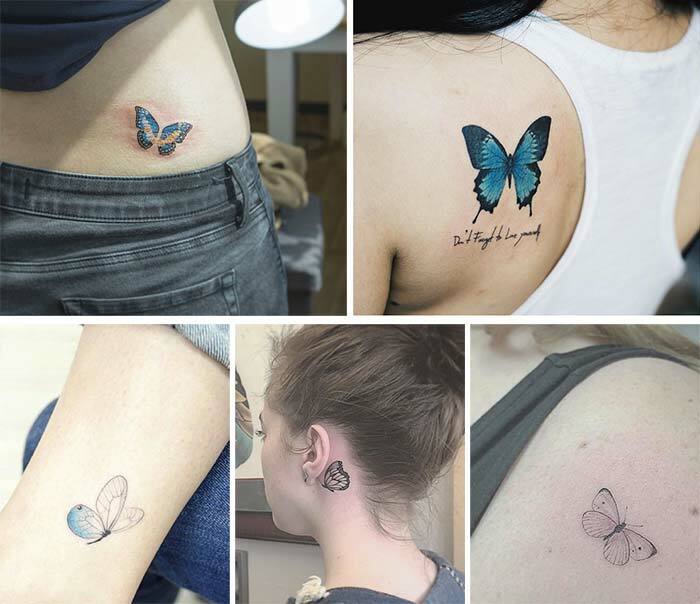 And when one opts for a cute small butterfly tattoo to decorate a part of her body forever and ever, she has either undergone a spiritual transformation or is on the brink of doing it, maybe also stuck between two phases. Overall, butterfly tattoos come to symbolize the past consigned to oblivion and the present being embraced wholeheartedly. Drew Barrymore and Mariah Carey have been spotted on the beach carrying butterfly tattoos. Cherry blossom tattoos may reach their pinnacle of beauty when done on a large scale across the whole back, for example. 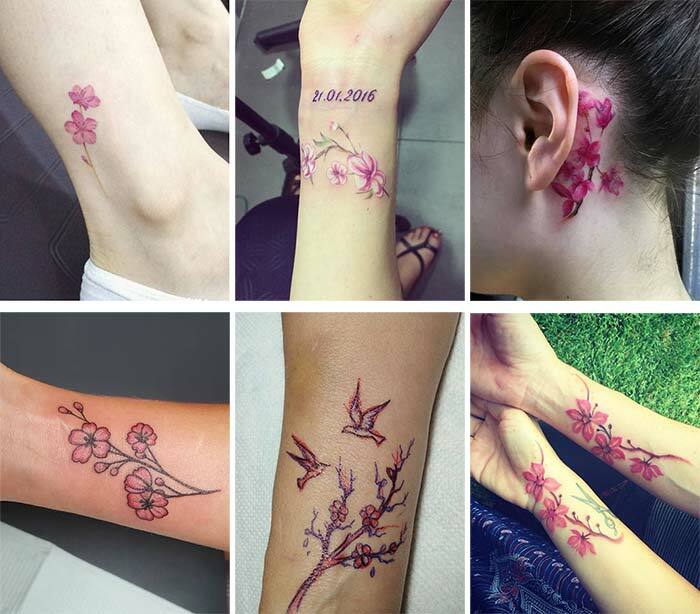 A tiny cherry blossom tattoo is also so pretty and magnetizing, usually tattooed on a wrist, on a finger or so much more attractively on a back, especially with a couple of petals falling down. So what is this ethereal thing boxing up? Cherry blossom is the national flower of the Japanese people, which they ceremoniously call “Sakura’ in Japanese. It is well known that the blooming period of these pink flowers is very short; they may cease to exist any time possible, much like it happens with a human life. So this tattoo design is a constant reminder to live to the fullest, as life is so short. In the Chinese culture, the cherry blossom symbolism boils down to the nigh same instantaneous life paradigm plus implying some touches of feminine sexuality and power over a man. Whilst for the Buddhists the emphasis is placed on the credo to live in the present moment, to forget the past and to leave the future to the destiny. Yours is only the present! 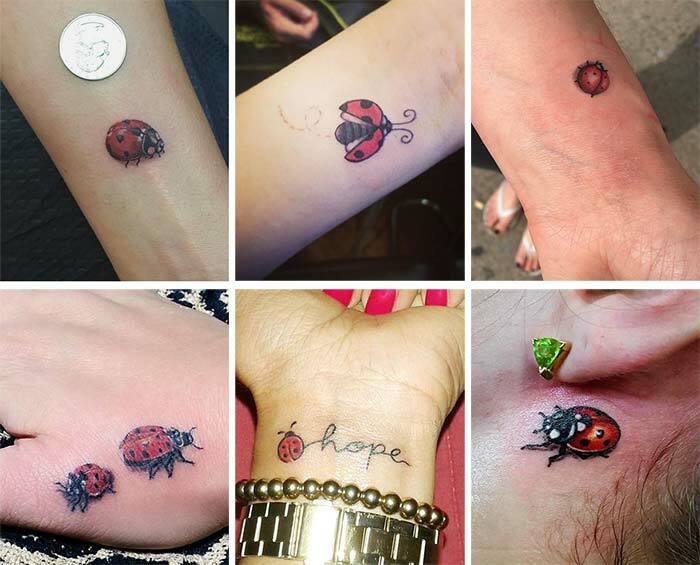 Though cute, small ladybug tattoos are not so widespread as, say, flowers, butterflies or hearts, they make far the most positive and inspiring tattooing idea, really. Through their being so tiny, these pretty red insects covered with black dots come to be super functioning when in hesitation to go for tattooing or not. Tiny ladybug tattoos may be placed on the wrist, finger, on the shoulder or lower back, behind the ear or on the hip either alone or climbing up a flower bush. Overall, a ladybug is a symbol of good luck, prosperity, bliss and jubilation. According to the Chinese, if a ladybug lands on one’s head, he will have a lucky day. If it lands on the head of a single girl, it is needed to count the dots on the ladybug, which determine in how many months the lady will get married. In case of a married woman the number of dots indicates how many babies she will have in the future. In Christianity ladybug is considered to be a holy insect. Back in the middle ages Europe was suffering great crop damage because of bad plague of crop eating insects. The Christians started praying to Virgin Mary for help and then a huge amount of ladybugs appeared killing all those insects. That is why ladybug also comes to be a symbol of friendship and aid. The symbolic meaning behind angel wings tattoos may vary depending on an individual’s life experience or belief. Angels are creatures sent from the heaven to protect and safeguard us from any kind of perils; that is why many women opt for small angel wings to be tattooed on their nape or back to feel the presence of a Guardian angel all the time, while for some angel wings may become constant reminders of someone special who has passed away. In other cases this tattoo may just symbolize spiritual evolution of the soul. 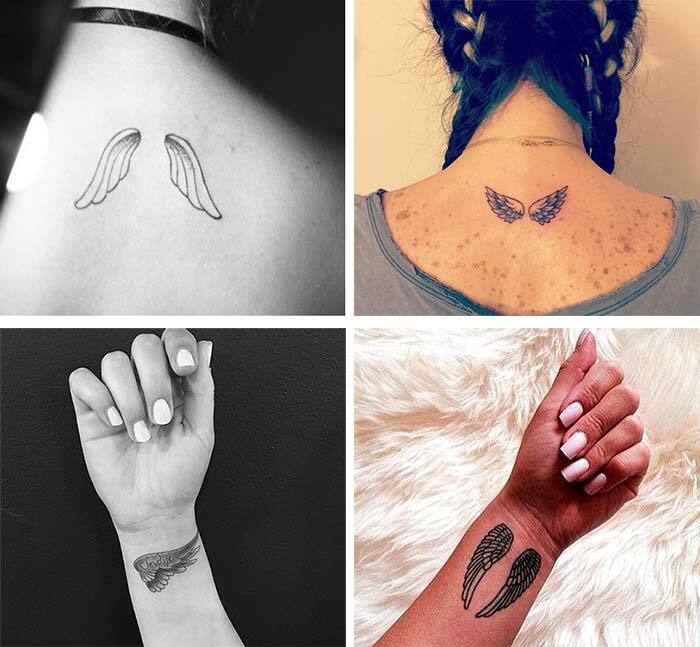 Beyonce, Jenna Dewan and Nicole Richie are angel wing tattoo fanciers. Ancient Egyptians adored it, the Hindu give it some sacred traits holding it highly in reverence, while for the Chinese and Japanese it is the way to enlightenment. Obviously we are speaking about the lotus, that all-powerful and stunning flower that grows out of mud, in murky waters, blooming on the surface of water into a delicate flower, pure, clean and without any stain of mud. 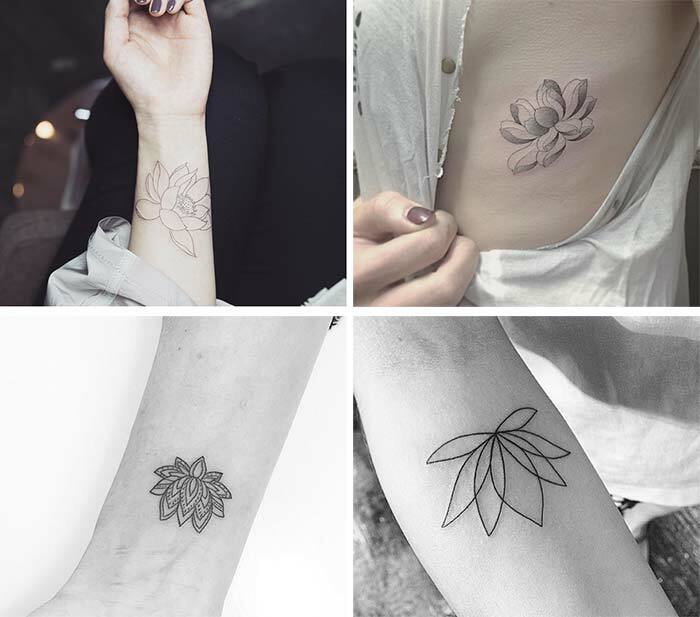 A small lotus tattoo on feminine skin may imply winning out all life miseries and perils thus resurrecting as a new, pure creature. What is more, in the ancient times the petals and seeds of this sacred flower were used for some healing purposes, while also being widely used in food industry even now. So one may wear this lovely flower tattoo on her skin as an impetus to never experience any moral or psychological exhaustion, come hell or high water or one may want to focus on its mysterious aspects, giving it some sexual meaning. Do you know enough about this teeny tiny bird? The unique and graceful hummingbird flaps its wings 50 times per second or even more; it can hover in almost any direction, even backward and upside down. A hummingbird has the most rapid metabolism of all other birds occurring in the nature, it spends too much energy, which may lead to eating 50 times a day so as just to survive and if it does not pull off to garner enough food resources it just goes in for hibernation. The unique traits of this bird could not but serve as a high-wattage momentum for many women to tattoo it on their bodies. 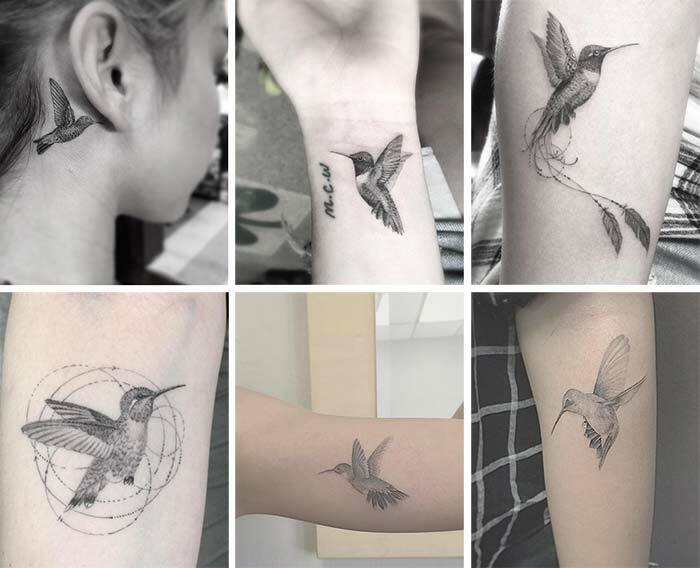 In general a hummingbird is a symbol of joy and love but its symbolism goes even further. It may also express high energy, agility and swiftness, high productivity and in some cases even lying down in a peace only to pile up more energy for more vitality. Hearts have always been used as a symbol of love and passion, adoration and devotion whether in painting, poetry or body art. 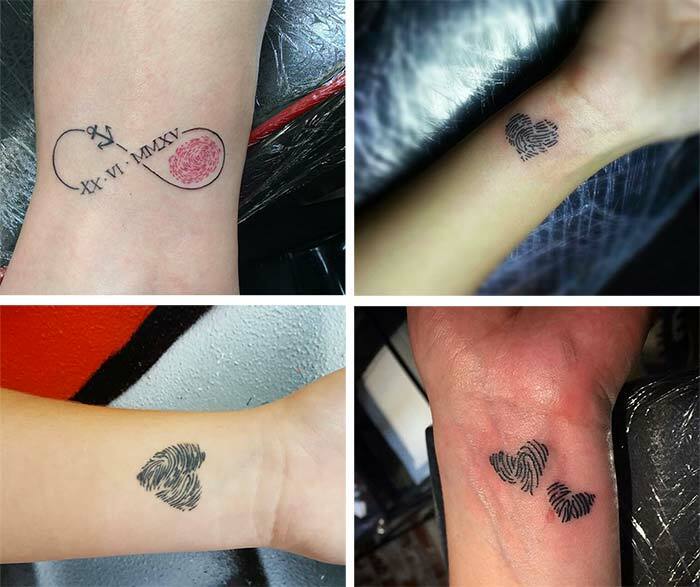 Heart tattoos may have different meanings depending on the concrete individual. One may tattoo a heart as homage to her great love to someone or to the life in general, for another one heart means great aspiration to find true love or it may also be considered as a central organ of vitality. There also happen broken heart design tattoos to emphasize that the individual has experienced something painful and disappointing in her life while a heart with wings is a symbol of free spirit and bliss. 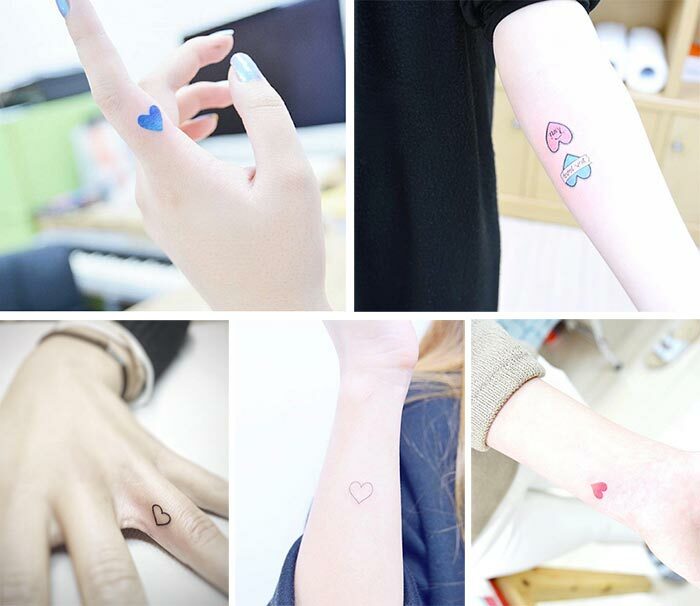 A heart tattoo can also be paired with the name of someone precious or it may go in design with a dog or other pet as a love declaration to them. What are those astronomical objects that are shining and sparkling through the night as if guiding little flashlight? They are those stars that from time immemorial have been lighting up the travellers on their way. Proceeding from this, stars may be tattooed unto the body as a belief to be always guarded and accompanied. 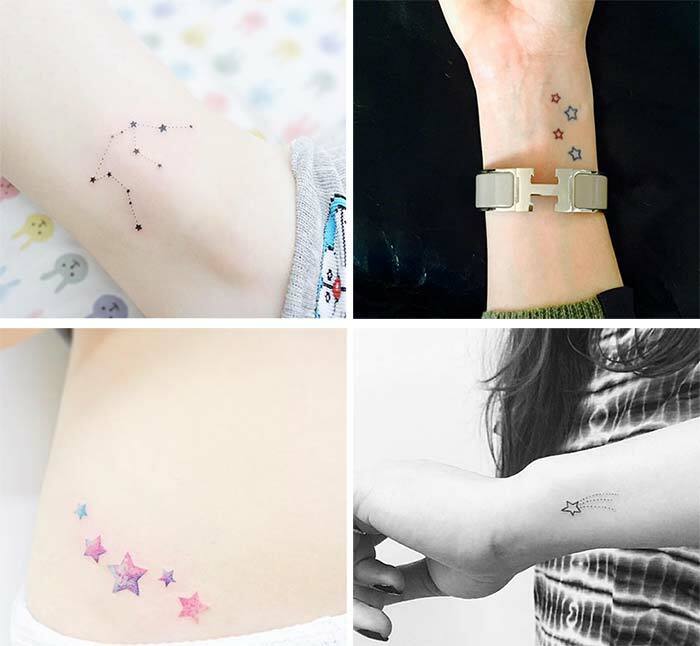 Apart from that, the symbolism of star tattoos may differ greatly depending on the number of its points. For instance, the pentagram or five-pointed star is a symbol of balance between our spirit and nature ” four points representing four elements of nature (fire, water, air and earth) and the fifth one uniting them all. 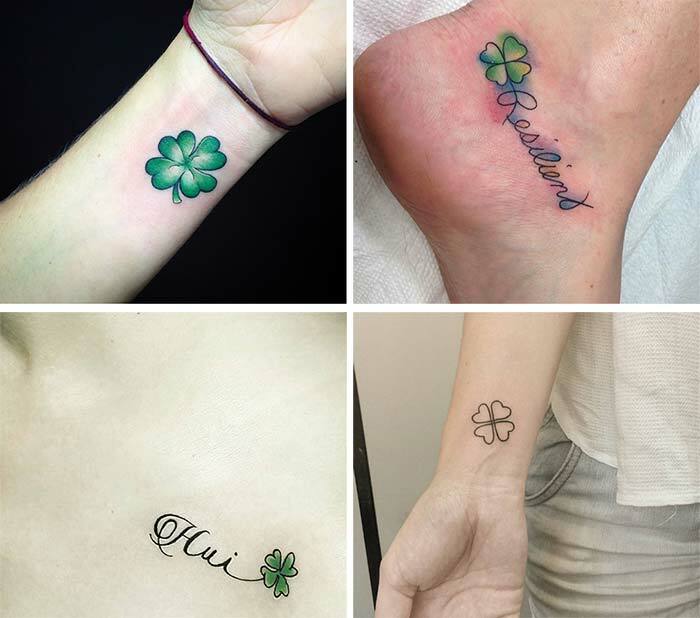 The celebrities carrying cute star tattoos are Kate Hudson, Eva Longoria and Gisele Bundchen. In almost all the cultures throughout the world the Sun personifies masculinity, i.e. strength and power while the Moon has always been the symbol of femininity, all emanating fragility and affectivity. The union of these two opposite figures brings down the Ying Yang concept, i.e. where there is good there is also bad, without bad good cannot be perceived in a proper manner. So whether Sun and Moon are tattooed separately or merged in a circular frame, they indicate the coexistence of two opposite traits in an individual, which are at times living in harmony, but at times also struggling frantically against each other. The name of dandelion in and of itself rings a bell; I momentarily go back to my childhood, skylarking through fields and clapping hands with glee upon the glimpse of a dandelion. I remember it so clearly to pluck this fragile flower off the ground, tightly close my eyes, making a wish and blowing off the dandelion seedlings, then opening the eyes to see all the seedlings to the last blown off ” my wish will come true then! 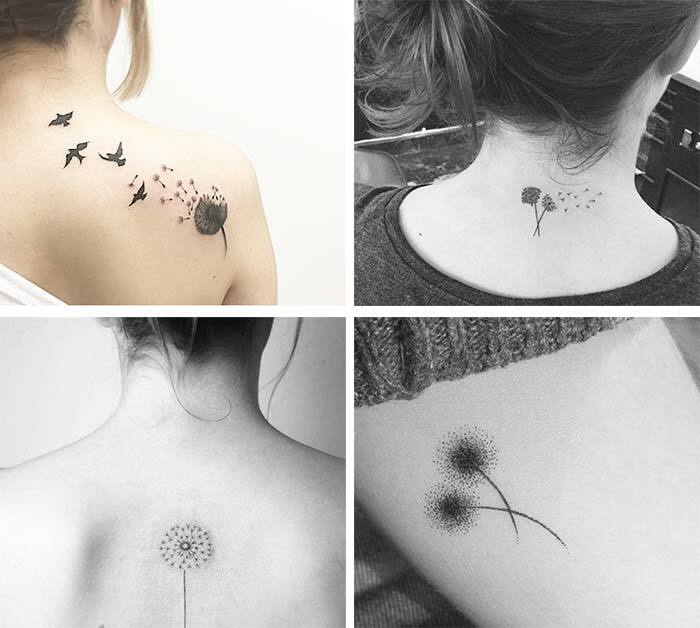 So, above all else, dandelion tattoos are firmly associated with human dreams ” either dreams already fulfilled or in great aspiration to come true. It may also be interpreted as life being so short. 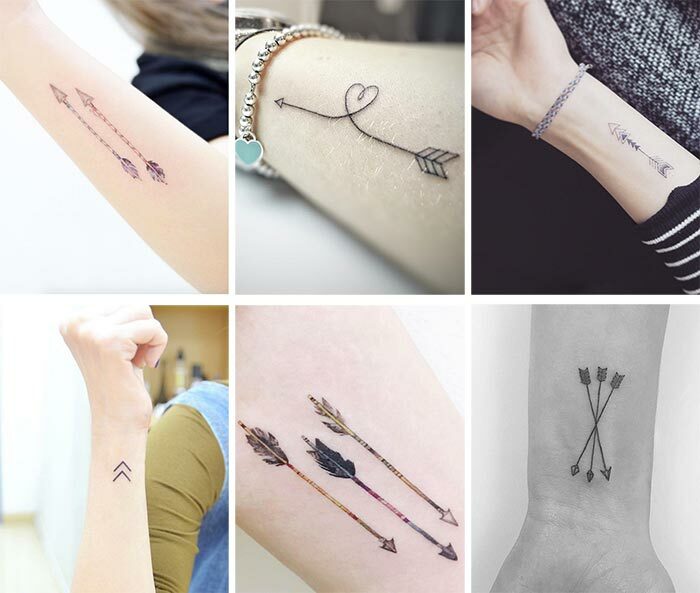 For Native Americans an arrow serves as a hunting and protection weapon, it is the weapon of Cupid who is in constant search of uniting two people with love; an arrow is also an element of the Zodiac sign, Sagittarius. In one way or another arrow is always directed forwards and in no way backwards, that way always propelling the arrow tattoo carrier to move on with newer and newer ambitions. It may also signify a lifelong path already determined or being searched vigorously. Two crossed arrows represent friendship and are often tattooed in pair between two faithful friends, but if they are tattooed in reverse directions, they become the symbol of war. One of the best small tattoos for girls, a broken arrow stands for peacemaking and a bundle of arrows is an emblem of unity and strength. Stamp a small arrow or two anywhere on your body whether on a finger or behind the ear and move through life on and on and on. When the vessel is to be hooked into the seabed at the harbor, anchor is used; when the ship is wavering on troubled waters, anchor is dropped into the sea bottom for stability. So, anchor selection as a permanent body decorator is a reference to stability and security in every aspect of life. It may also indicate great love of its carrier for water. The eccentric and crazy celebrities like Miley Cyrus, Kate Moss and Lady Gaga are overtly not stability enthusiasts. 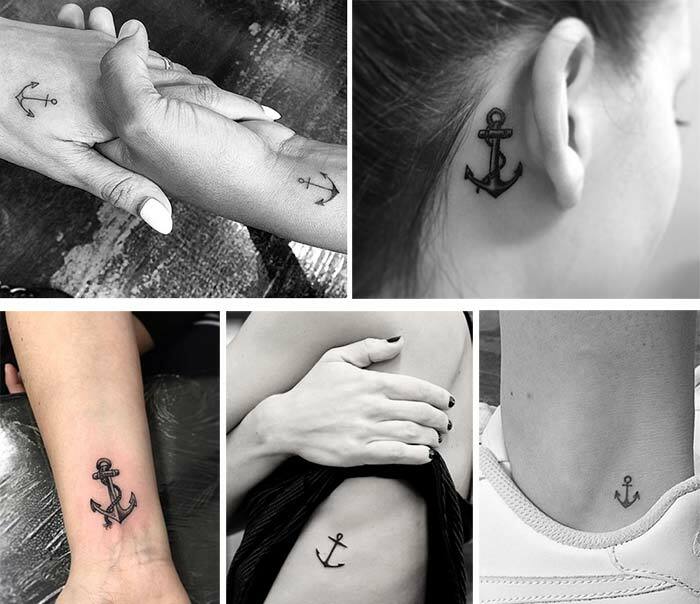 Then what do their anchor tattoos signify? Come on, let it remain a secret! The appearance of the giraffe with its high, grandiose neck is already enough to suggest its being the symbol of grace and elegance. But the symbolism of this artistic animal does not end in here. A giraffe tattoo wearer may have picked this image as a sign or more probably as a momentum to gain far-seeing and long-reaching vision, to enlarge horizons and to always look down at own problems from above, weighing them all objectively. 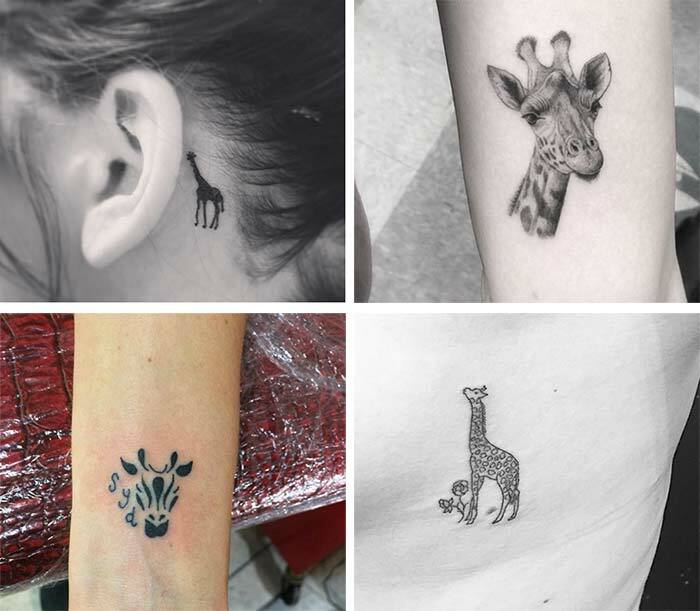 Small giraffe tattoos may happen in their natural colors or abstractly iridescent, more often on the forearm or on the ankle. Before its being melted, just try for a moment to stare at a snowflake and to catch its complex, yet so delectable structure. No two snowflakes falling down so gracefully from the sky are alike; each snowflake has its unique structure and size. So a small snowflake tattoo emphasizes its carrier’s uniqueness and individuality. A snowflake tattoo may also signify peace and composure as it is falling down so silently unlike the rain and it may also symbolize rebirth and transformation, since when melted it does not vanish but transforms into water. 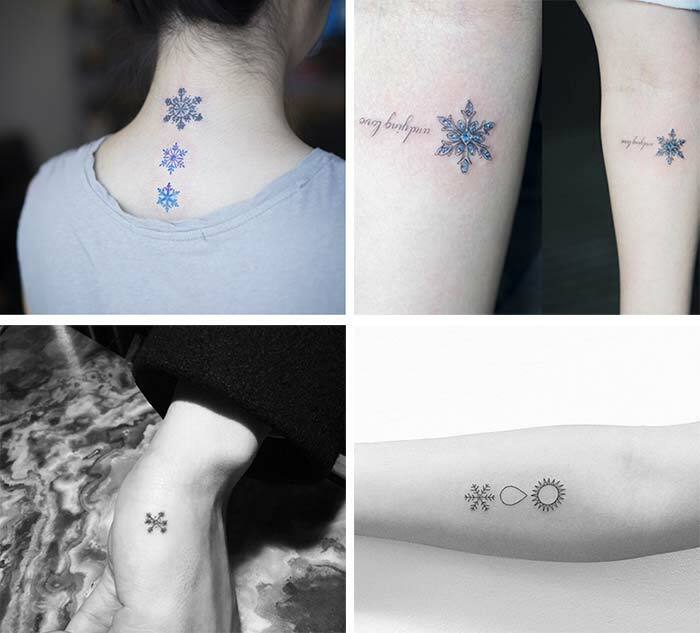 Which one of these meanings does your snowflake tattoo convey? Maybe none of them, yours is not written anywhere! • Not so long ago a natural mummy of ‚Äö√†√∂‚àö¬±tzi the Iceman was discovered on the Alps, which had been lying there for over 5000 years. But the most amazing part of the story was that the explorers found some vertical and horizontal lines on its body leading them to a hypothesis that they might be chasing some healing purposes. • It was Captain Cook who brought the word “tattoo’ or “tatau’ to Europe from his first voyage to Tahiti and New Zealand in 1769. Before that this art was being described as scarring, painting, or staining. • The M‚àÜ√≠‚àö√ñori people inhabiting New Zealand are tattooing their whole face with intricate and unique motifs serving as real masks ” T‚àÜ√≠‚àö√ñ moko. This is a symbol of heroism and social status. • During the World War I the British deserters were being tattooed by the letter “D’, while each victim of the concentration camp in Germany was carrying a separate identification number inked on his body. • The most lasting tattoos are those designed with yellow and green pigments. Keys are so important in our lives ” a key to the flat door, a key to the drawer, and metaphorically also a key to the heart. We are opening and closing, closing and opening many things with keys. So, a key tattoo on someone may hold the meaning of so many opportunities in life ” a lot of doors to be locked and a lot of doors to be unlocked. 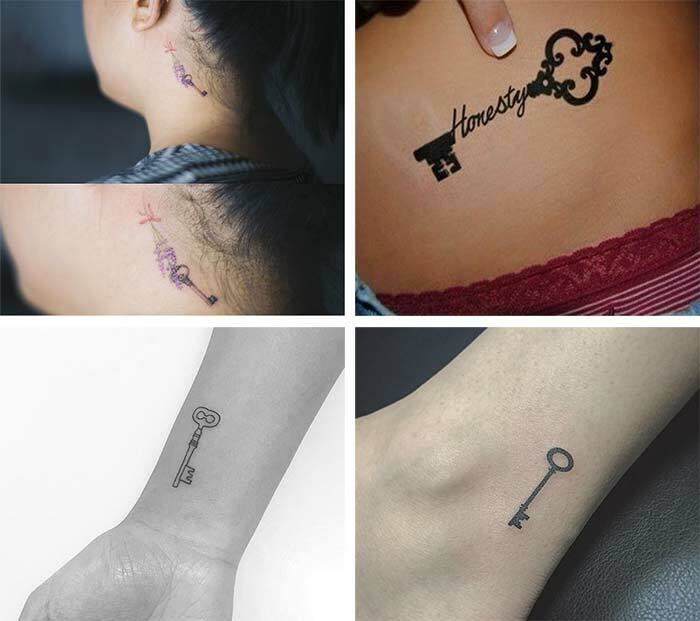 But a mystery-addicted lady may carry this small key tattoo as to show the mysterious side of her essence. A skeleton key tattoo that functions for all the doors can become a powerful stimulus for its carrier to always face life challenges opening all the doors on life path. Dragonfly is born in murky waters, then passing some metamorphosis phases just like it is with butterflies. It is a creature of both air and water and it may also change the colors of those fragile wings. All these traits make this insect so very unique, with multifaceted aspects to it, also making it one of the most beautiful small tattoos for girls. 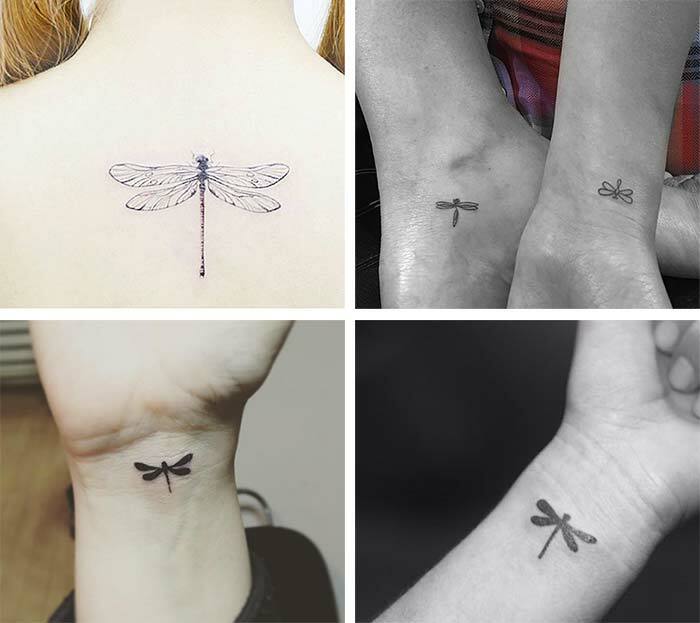 So before going to a tattoo artist to ask him to ink that mysterious dragonfly on your wrist, decide upon your dragonfly tattoo message ” whether you want to give priority to transformation or courage and strength or maybe higher subconscious and deep feelings. 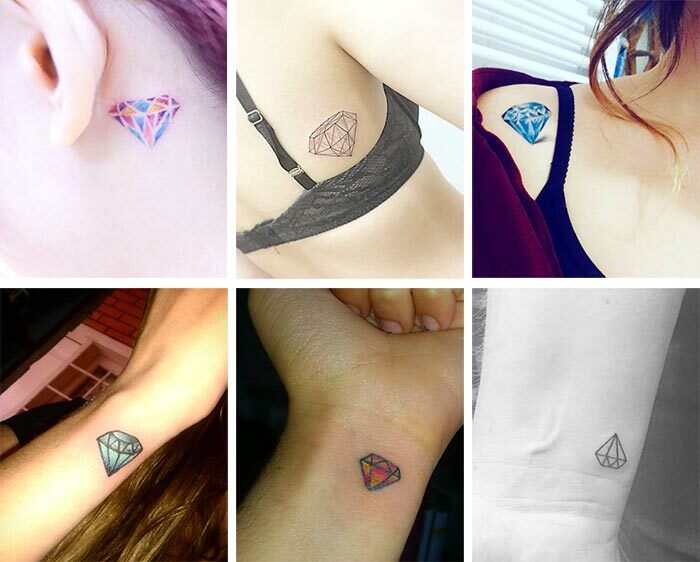 Diamonds tattooed on a female body may go in keeping with her realistic diamond ring around the finger, while also misleading others that the lady’s diamond tattoo is expressing her great love for luxury and beauty. Do you know that the word “diamond’ has Greek origin meaning “unbreakable, invincible’? If you are aware of this fact then you will to all appearances change your mind about the lady’s diamond tattoo signifying strength and power rather than just luxury. But think twice. After all, initially there is “diamond in the rough’, which shows off all its grace and beauty after being polished. So maybe the lady is chasing inner beauty accenting purposes. Swallows have always meant a lot to sailors. The appearance of any swallow at sea may drop a hint that the land is near. That is why if you happen to meet a sailor with swallow tattoo, then rest assured that it is reflecting his great hope to return home safely. Swallow chooses a mate for the whole life and always returns home come rain or shine. 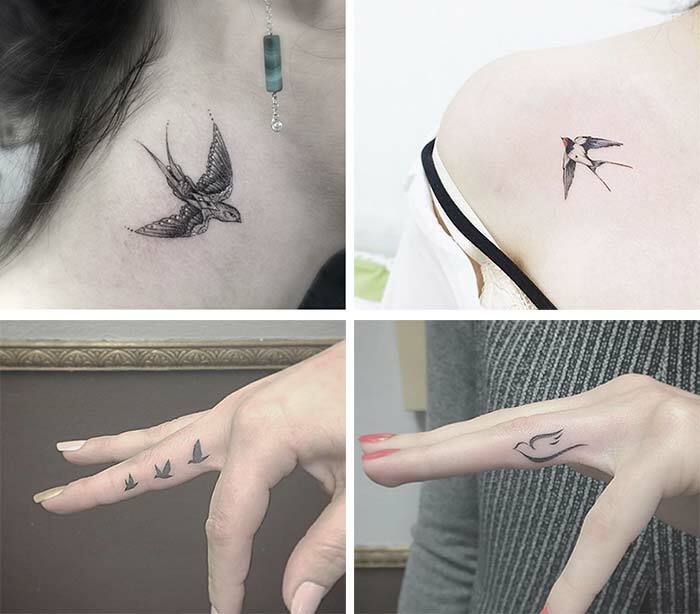 So a swallow tattoo carrier may also be declaring to all and sundry her great love and royalty to the family. 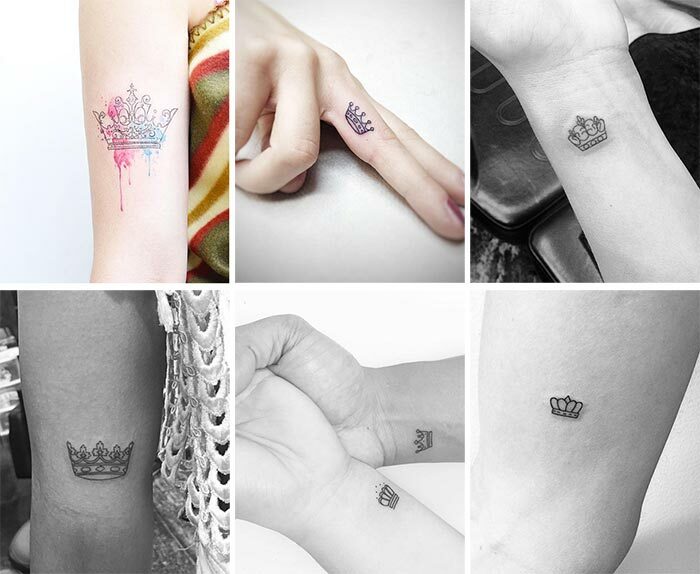 Another small cute tattoo idea for girls is brought by a crown that may be placed anywhere on the body. It seems that the crown-tattoo-wearing woman is endowed with a power and right to rule others. For some group of women crown tattoos really have that very meaning, whether they have graced themselves with authority or have been chosen by a group of people as a leader. But the crown may also symbolize self-control and reigning over one’s own emotions and actions. Lastly, many couples love matching crown tattoos as well, although there are a variety of cool tattoo ideas for men to explore as tribute to their significant other. 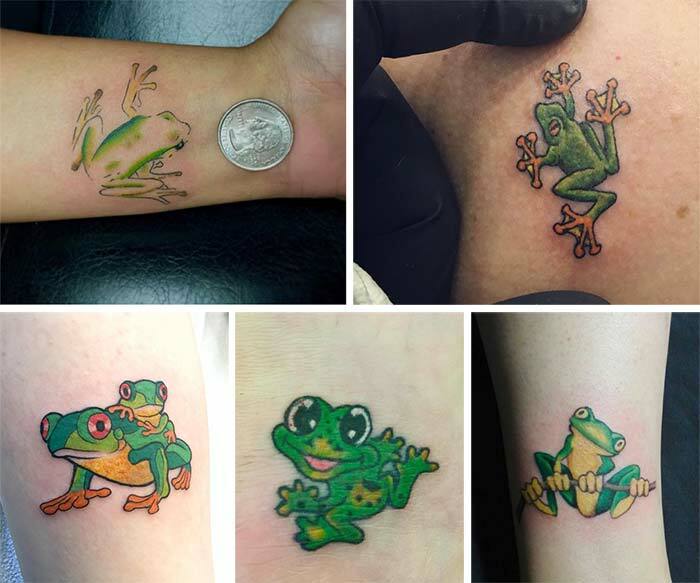 These green creatures with sticky green skin, tittuping from here to there with their so annoying croak may become a cute small tattoo but in no way expressing anything negative. Frogs are amphibian creatures, living both in waters and on the land, thereby symbolizing balance and adaptation in the life of frog-tattoo-wearer. This rich red colored fruit, so juicy and meaty in biting is more often associated with feminine sexual power and lust. 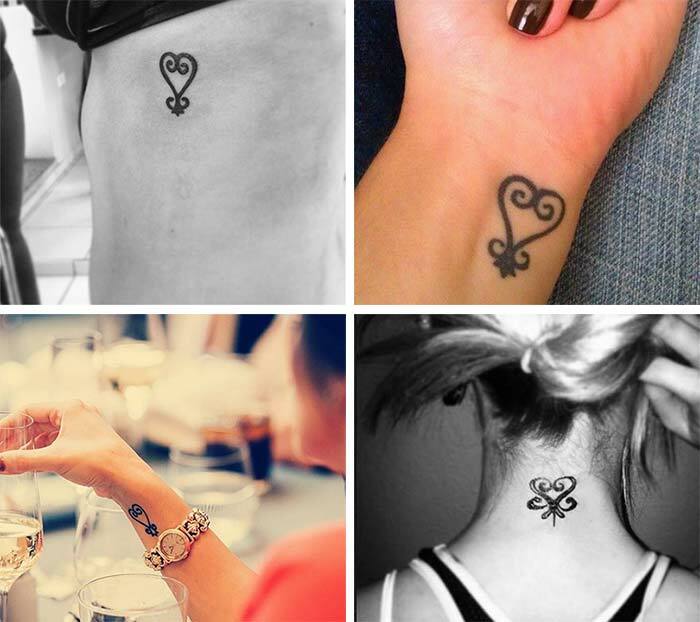 They are tattooed either single or in pairs and look so magnetizing when placed behind the ear or on the lower back. When portrayed with several juicy drops leaking down its sexual symbolism becomes magnified, while a cherry still hanging from the tree is a symbol of purity and immaculacy. What is left? 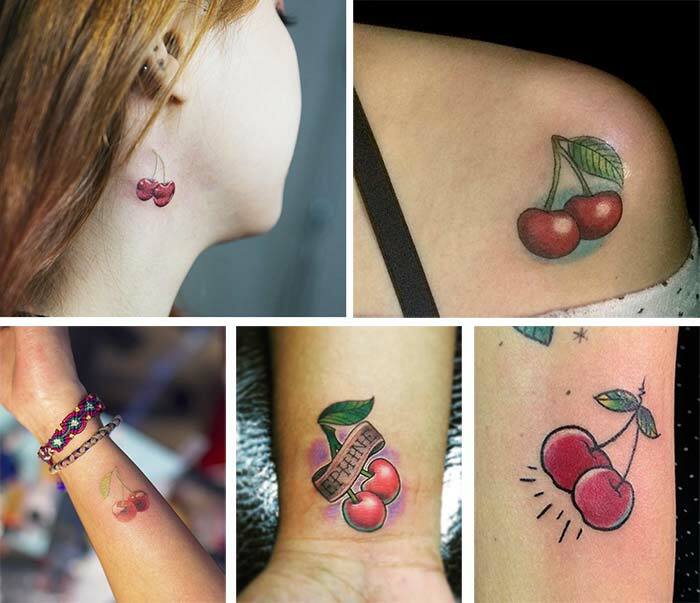 Just to find an expert tattoo artist for realistic cherry image to be brought unto your body. Each person’s fingerprints are unique and when you carry fingerprints of an individual on your body, you are declaring to everyone that the fingerprint-owner has deeply touched your heart, your essence and your whole life. This fingerprint motif can also be used to form other images, like hearts or animals. 24. Small Compass Tattoos: Chop ” Chop, Orient Yourself! 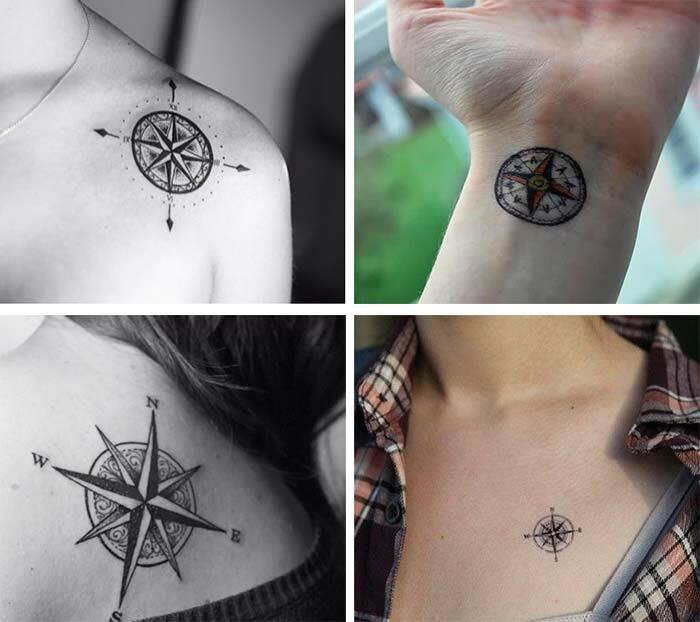 Spanish conquistadors were the first to bring compass tattoos unto their bodies, a habit later on spreading among all the sailors. Carrying the compass sign they had a strong persuasion that they will be guarded and will return home safely. Moreover, the members of their families were also keeping something in compass design ” be it a tattoo or a charm as a symbol of hope that no peril will touch their close people. Apart from being the symbol of security, guidance and good luck, compass may also stand for the right life direction to be found eventually. Are you after great luck and great fortune? 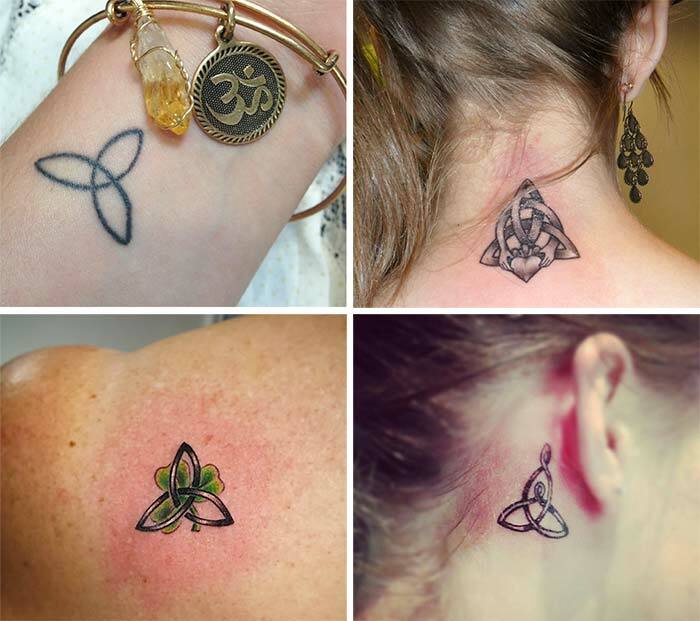 Head to Ireland to find that rarely occurring 4 leaf clover, or else head to an expert tattoo artist to acquire an everlasting luck on your own body. This wonderful plant has always been considered as a symbol of luck all over the world and if found accidentally by someone, the luck will follow that person in a little while. Additionally, each leaf of the clover holds its special meaning: faith, hope, love and luck. Some Irish people may also ink this amazing plant to express their great love for Ireland. 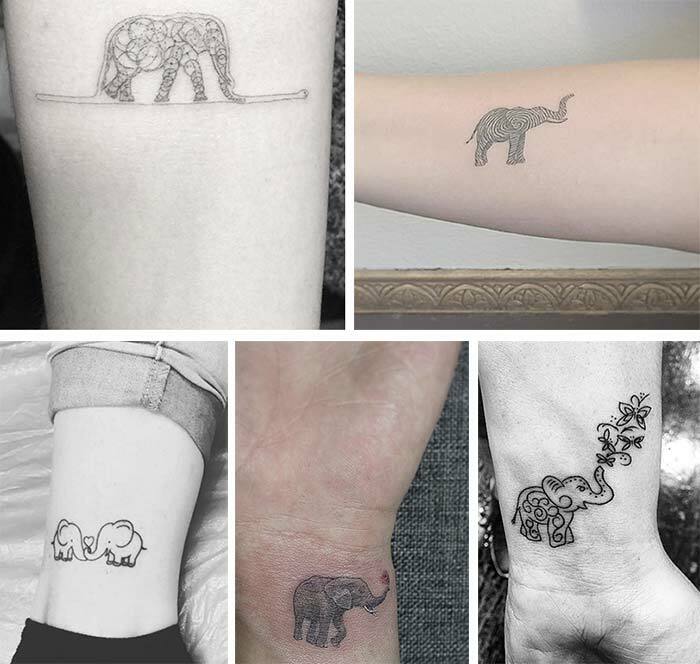 Though elephant is one of the giant mammals, it may be depicted somewhere on your body in a small scale to make just another cute small tattoo for girls. What message is sending the elephant-tattoo-carrier? Elephant is enormous weighing up to 8 tons, with height reaching 8 inches and it may seem to be extremely dangerous, but if not provoked, elephants are very calm and friendly creatures. So, a person who has gone with elephant tattoo is apparently aspiring to highlight the correct balance between his powerful and calm essences ” “if not intrigued, I am all sweet and fluffy’. Elephant tattoos may also symbolize loyalty, great devotion to family and wisdom. Your free spirit and celestial essence will be best revealed by the feather tattoo imprinted somewhere on your back, forearm or knee. Feather descents to the ground from a bird, hovering freely in the sky and when you bring this element onto your body it somehow shows your wish to be as free as a bird or maybe you have already achieved the desired freedom. But maybe you want to pair freedom with strength and power then the best choice will be an eagle feather whilst the freedom + regality combination can be brought about by a peacock feather tattoo. 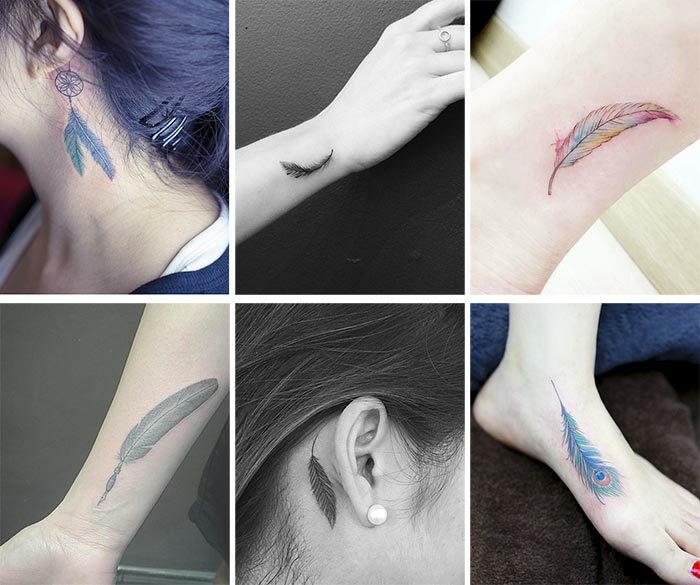 But your small feather tattoo may also be shaman type to connote your direct relationship to the spiritual world. A massive world map tattoo inked on the whole back area is really impressive but you can also try its mini version on your wrist, ankle and also on the back. 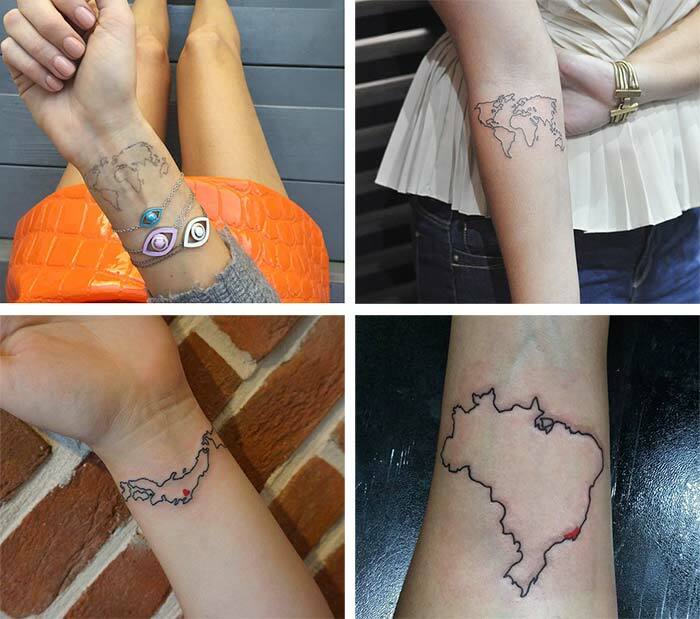 World map tattoos may indicate your great passion for travelling and also your great dream to travel around the world. It may also have a negative meaning when inked on the back, like “Oh, I am carrying the weight of the world on my shoulders’. This weirdly looking little creature living in deep waters was considered by Greeks and Romans to be an attribute of Poseidon, the mythological god of sea, whilst the ancient Europeans considered seahorses to be trustworthy carriers of souls of the sailors dying in waters to the other side of life. In this sense a cute, small seahorse tattoo may be a symbol of mythological power and superiority, while also being a charm of good luck. Additionally, the seahorse may change its skin color when facing some dangers, it may wrap its tail around something not to be wrecked by troubled waters and one more unique feature to it is that it is the male seahorse that carries the eggs, not the female. 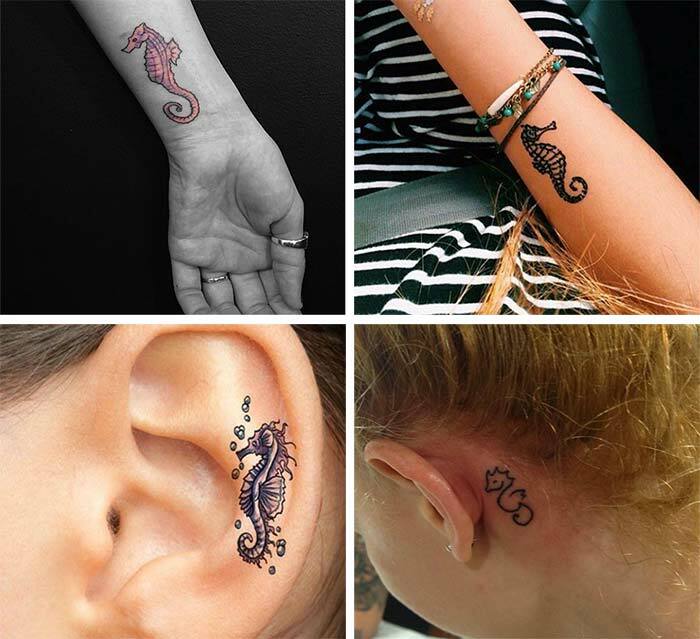 All these unique traits make them absolutely different from other creatures, thus also making seahorse tattoos the symbol of creativity and fantasy. Bows are all the rage now, starting from being hair accessories and jewelry pieces to decorative attributes of garment pieces and shoes. They are so feminine and coquettish, anyone may agree. So if a woman has selected a bow tattoo to decorate a part of her body, it may just pursue fashionable purposes and nothing more. 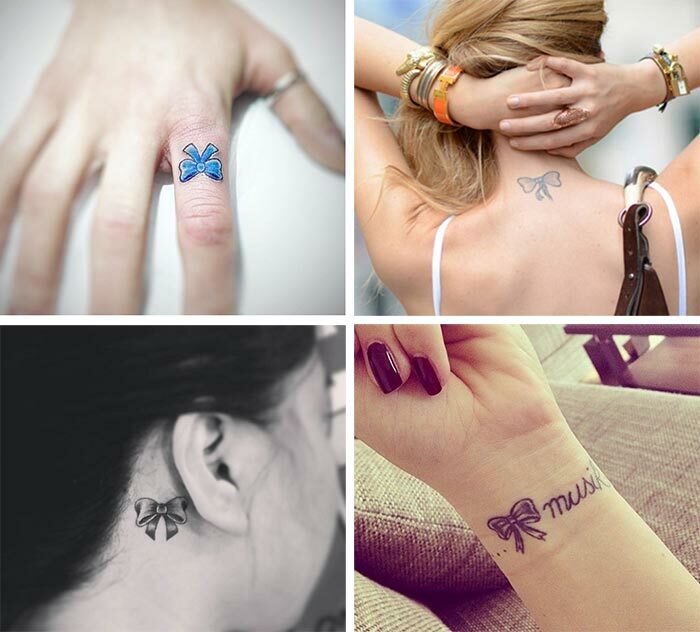 However, some girls with attitude put deeper meanings into a bow tattoo. Bows may also represent a sign of giving whether some materialistic things or sweet feelings and emotions to people around but maybe your bow tattoo is all about remembrance. We are just trying to guess whether you remember someone special or an oath given to yourself or maybe a life principle, who knows! If left alone in the darkness somewhere in a forest, you will instantly get panicked. We have much to learn from owls, the sentinels of the night, the only creatures that are moving through the darkness freely and without any mess, whose eyes are perfectly adjusted to that all-frightening night. A woman with an owl tattoo on her body definitely has a story to tell everyone ” “When I am experiencing dark times in my life and there seems to be no way out, I just start acquiring a taste for night’. 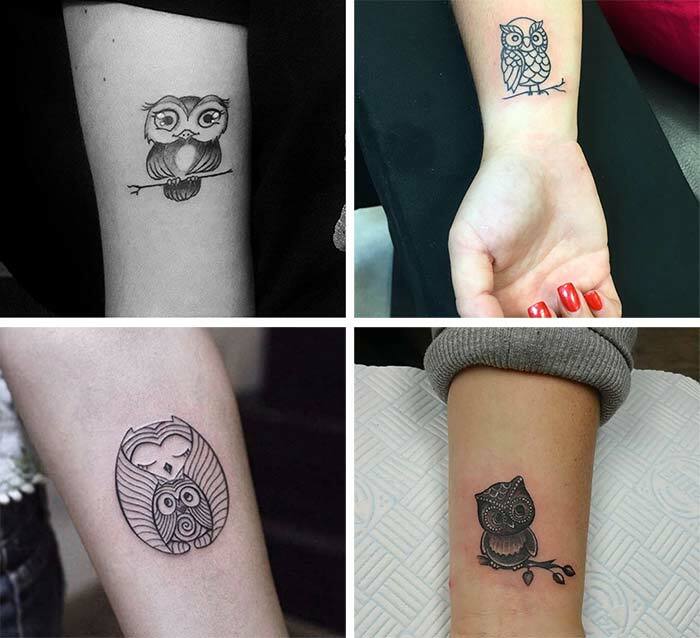 Additionally, the owl is a symbol of mystery, intelligence and wisdom. After all, it was sacred to Athena, the Greek goddess of wisdom. Definitely one of the most romantic small tattoo ideas for girls, this magical swaying amulet having its roots in the culture of Native Americans is usually being hung in the bedroom, over the bed to catch bad dreams, at the same time letting positive ones pass through it. 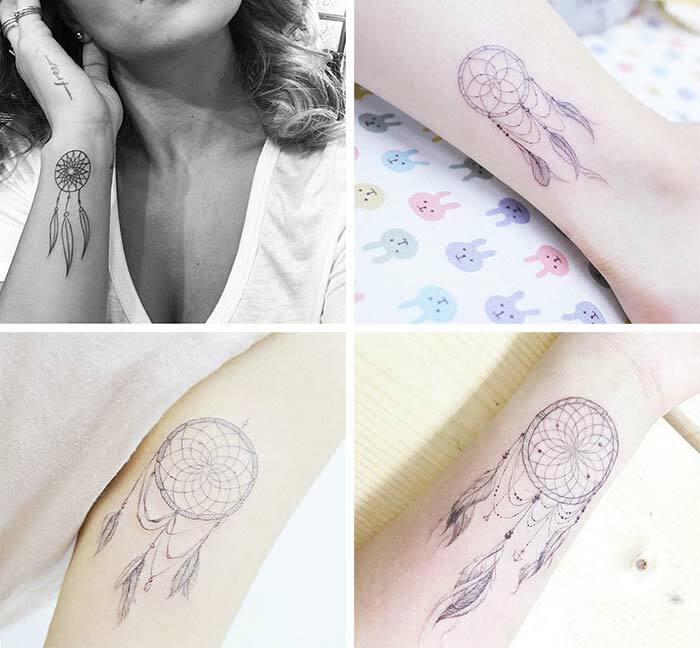 Who knows maybe the secret to the frantic success of Kendall Jenner and Miley Cyrus lies in dreamcatcher inks decorating their sensual bodies? 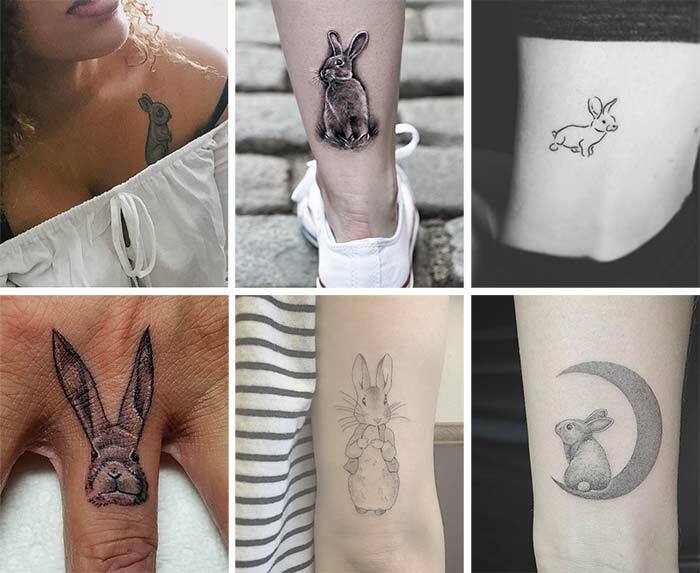 Animal paw tattoos are also gaining great popularity among tattoo enthusiasts, whether inked single or in two, three versions. 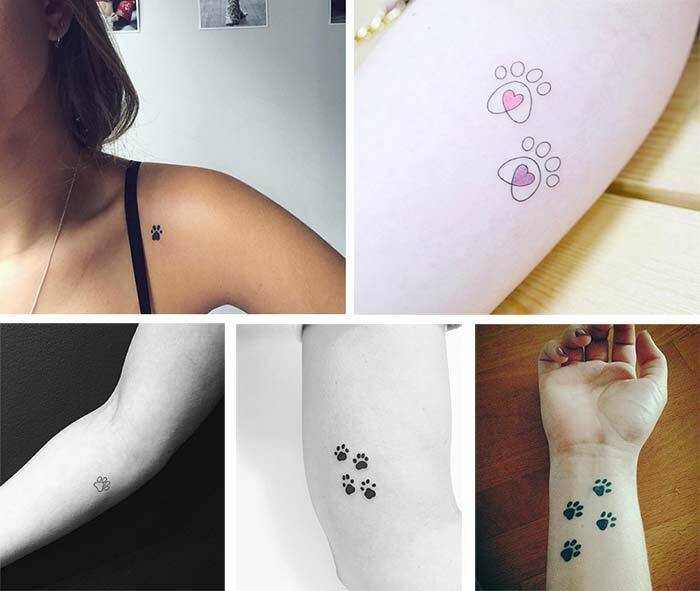 One may carry a paw tattoo as a sign of great love to his/her pet or it may signify always moving forward against all the odds. Its meaning may also vary depending on the animal type it belongs to. For example, a dog paw tattoo carries the symbolism of loyalty, devotion and readiness to always protect its dearest ones, while a cat paw-tattoo-wearing woman may be after to expose her selective character and the ability to turn into an extremely affectionate and velvety creature when faith and reliance come to play around. • The first electric tattoo machine was patented by the American tattoo artist Samuel O’Reilly in 1891. • It turns out that temporary tattoos are not so safe. According to FDA the black henna ink contains PDD, which may cause permanent scarring. • The survey results in the USA show that women are being tattooed more than men, but women get their tattoos removed more often than men do. Click here to see removal info. • The first man whose name entered the Guinness Book of Records as the most tattooed man in the world back in 2007 was rocker Tommy Lee. • In prisons the jailbirds get their bodies tattooed using such instruments as pens, springs, soot and even melted boot heels, which they mix with blood or urine to get an ink. • There was such a superstition in Ancient Egypt to tattoo a pregnant woman’s abdomen with a web, which would gradually stretch, thus protecting the baby in the womb. We are listening to music to just relax; we are listening to music to celebrate something. We are doing it for many other reasons. 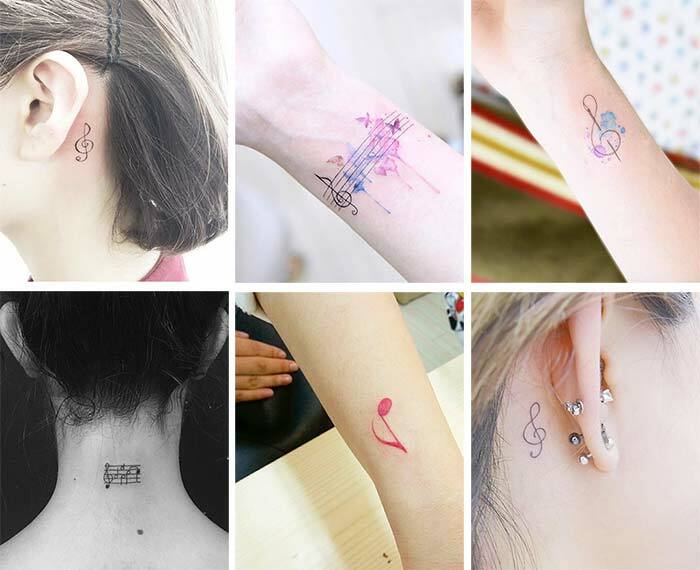 So a music note tattoo may be an indication of anyone’s great passion for music and not only. 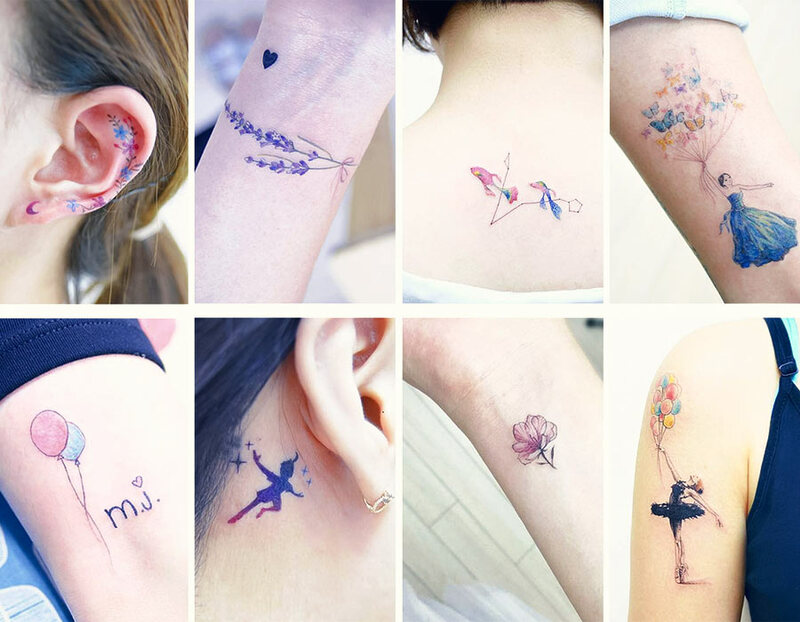 Such tattoos may also characterize the carrier as a very energetic person, a real ball of fire like for example Rihanna, who first went under tattoo needle decorating her left ankle with music notes. A city skyline tattoo is the thing for patriots, who are wild about the city where they were born, who are always impatient to return home wherever they go. But it may also signify a city where something special has happened and was sponged in memory. 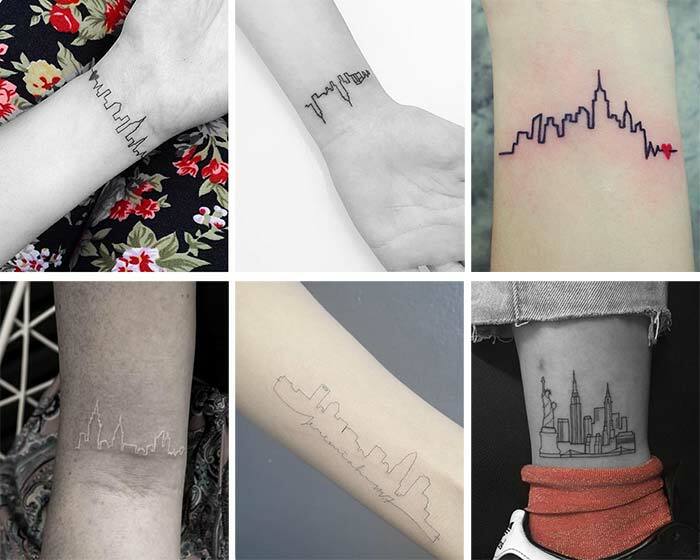 But maybe your skyline tattoo is mirroring your dream city. This tattoo design is best shining when imprinted across forearm or leg. Portraying this eye-catching fish-mammal on a body roaming through sea waves may really make a scene worth to be admired for ages. But the pulchritude of this creature goes beyond its appearance. In many Greek and Roman myths dolphins are described as human life-savers, who bring back lost sailors safely to their homes, while for the god of sea, Poseidon dolphins were messengers and errand runners. Hence, dolphins are highly social creatures, thus serving as a symbol of communication, intelligence, friendship and goodwill. Have you ever happened to admire dolphin joyful tricks? Have you noticed its as-if-always-smiling muzzle? In every possible aspect dolphins are exuding all positive sensations and dolphin tattoo preferring ladies are undeniably social butterflies. A case in point is Jennifer Lopez. Cautious and discreet steps, phosphorous eyes insidiously shining in the dark, mysteriously sounding Meow-Meow and somehow aloof and indifferent demeanor ” we are describing a cat, which is, according to Celtic lore, a Guardian of the Otherworld, keeping its secrets from common mortals. 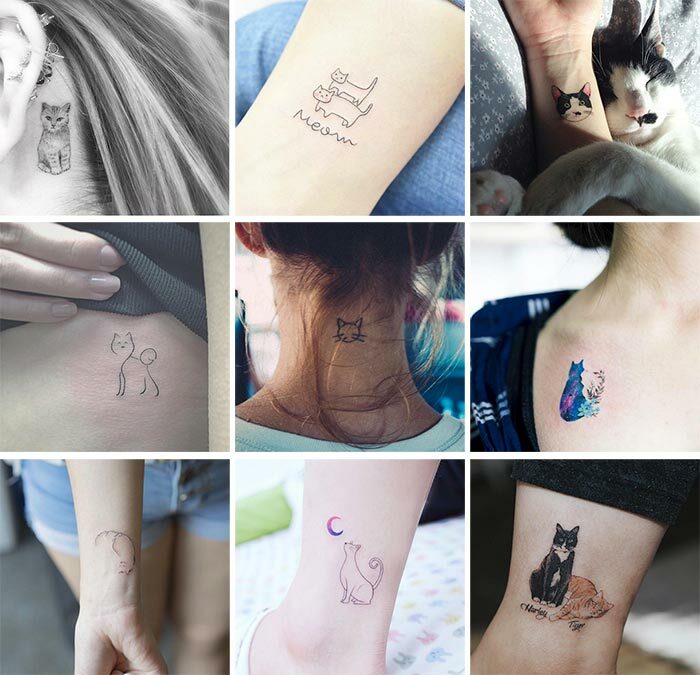 Someone carrying a cat tattoo overtly finds herself so closely connected with this animal ” always selective, independent and mysterious. In a nutshell, a real feline girl! 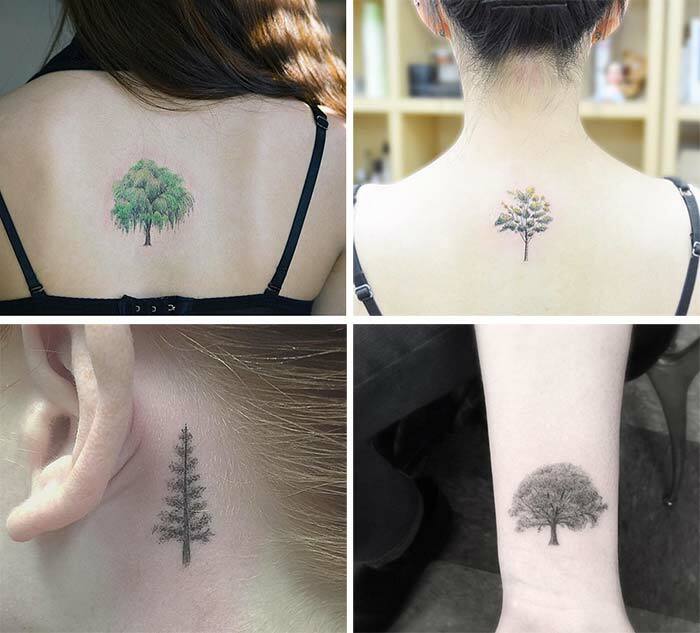 A small tree tattoo may also look very stylish on a feminine body, more frequently provoking curious discussions like “Why tree?’, “What do you mean?’ and also silent thoughts like “What is this girl’s secret?’ Just think about tree-typical qualities. They are long-lived (from 50 to 500 years), standing very firmly on the earth with roots stretching around deep under the earth, every single year fructifying and also serving as a venue for birds to weave their nests. 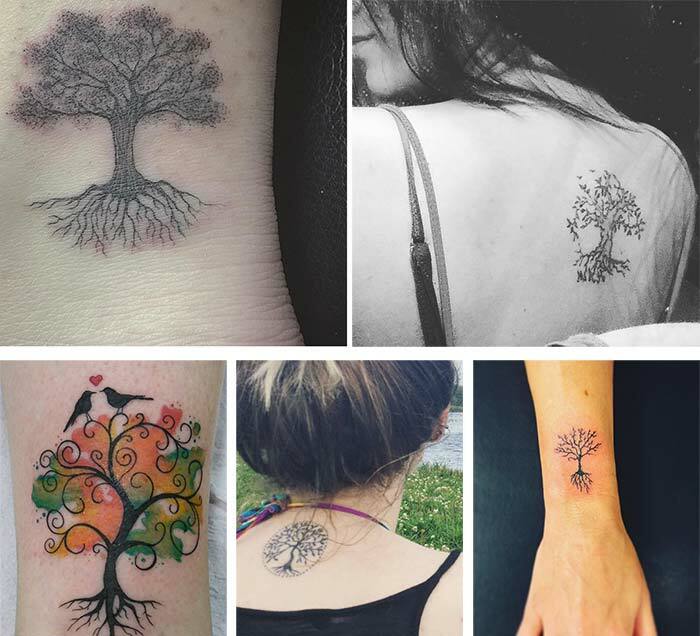 All in all, a tree tattoo is a symbol of strength, survival, stability and helpfulness. The Tree of Life is a concept depicted in many religions and philosophies. With roots stretching deep within the earth, with multiple branches reaching high the sky and all interlaced into a circle this cute tattoo stands for the oneness of every aspect of life. It carries an ample symbolism: immortality, eternity, knowledge, wisdom, strength, protection, abundance, growth, forgiveness and salvation. Which one will be camouflaged? It is up to you. 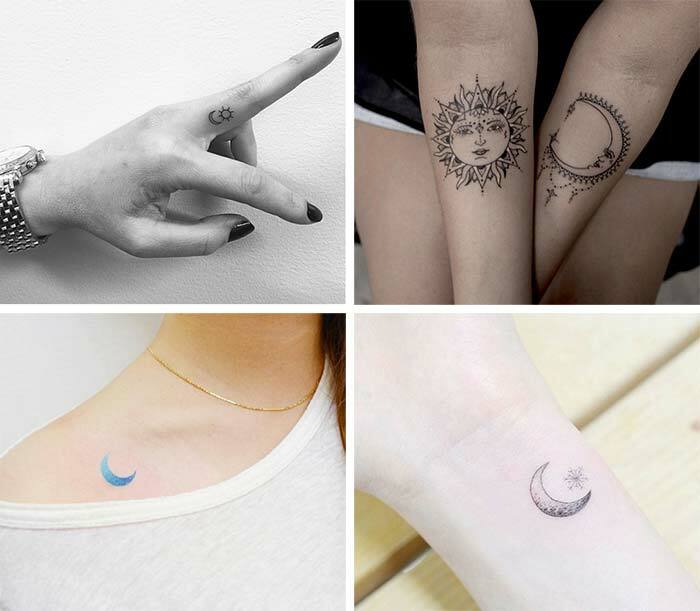 Zodiac signs are also very widespread small tattoo designs nowadays for those, who are so deep in astrology, know inside out all the characteristic traits of their zodiac sign and start the day reading the daily horoscope forecast. Among the celebrities it is Rihanna who has her zodiac sign ” Pisces, tattooed behind the ear and Rita Ora also keeps her Sagittarius zodiac sign tattoo on the same place. We can not only feel but also see our own heartbeating, more precisely the electrical activity of the heart, with ups and downs. What if it becomes a straight line? Life is over. 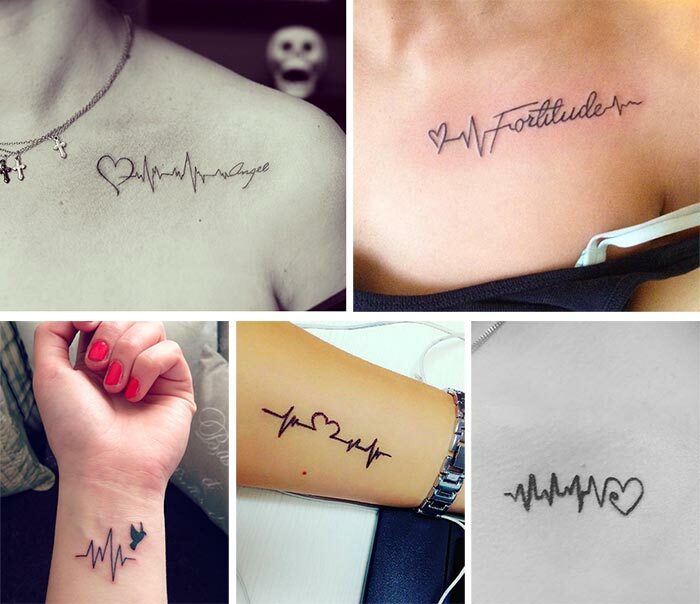 Going under the tattoo needle to bring forth the EKG image is a constant token that life is precious, and every moment of it should be appreciated. But it may also be imprinted on the body as to honor the memory of someone special. Anyone of us might remember the school years when the mathematics teacher was explaining that this is the infinity sign and it is written like lying 8. 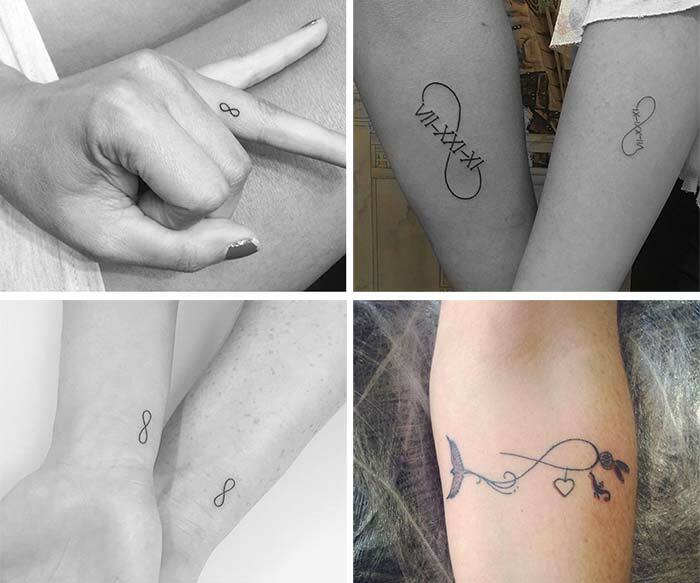 Small infinity sign tattoos are very individual; they may symbolize undying love, everlasting life principle or maybe the notion that we come and go, but life never ends. At first blush mandala image might be taken for an amazing flower but this is a spiritual and ritual symbol in Indian religions. Head to an expert tattoo artist, as here a very intricate handwork is needed. It is believed that if you carry a mandala, no negative aspect of life may touch you, but just on the contrary; you will become a magnet for positive events and feelings. Now Mandala is largely used in meditations and psychology to communicate with one’s own higher consciousness. • The philosopher Confucius considered tattoos to be against the Mother Nature, the body is the gift to a human being. • Plato was propagandizing to forcibly tattoo those guilty of sacrilege. Is there a venue where you pass by and feel beside yourself with joyful memories? Have you ever thumbed through your photos stopping at one of them, smiling to yourself and dreaming of going back there even for a moment? Acquiring the coordinates of the places so precious to you and inking them forever on your body might really make your days and nights. 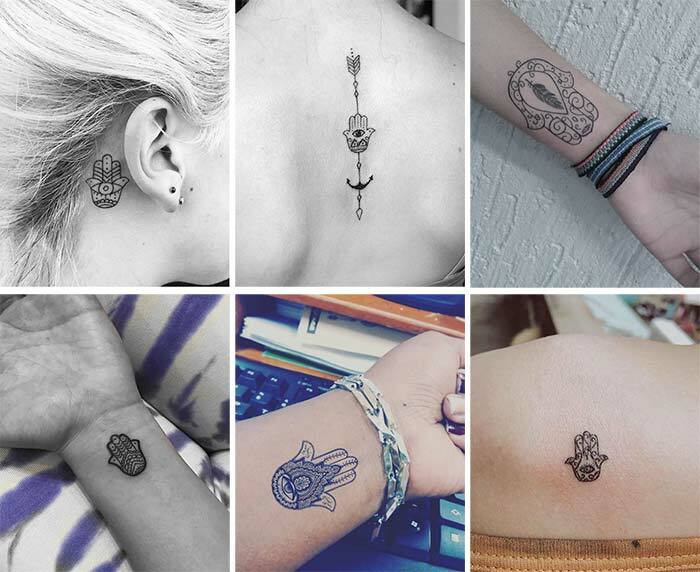 Hamsa Hand image is deemed to be the hand of God, who always guides and takes you under his protective wings. This amulet tattooed whether on the back or on the arm is promising to hoodoo the spirits and bring its carrier great fortune and blessing. It may at times also be depicted with an eye in the center, thus more highly emphasizing a watchful charm always accompanying you. Trinity Knot is highly important in Christianity, symbolizing the Father, the Son and the Holy Spirit, while according to Pagan lore the tree points of the triangular represent the three natural forces: earth, air and water. What other versions? ” Past, Present, Future; Spirit, Mind, Body; Life, Death, Rebirth. But you can work up your own Trinity with special meaning to it. This is a very wise piece of advice to always look back to the path you have passed analyzing all your deeds and filtering what is necessary to take with you to the future. But it may also mean going back to the roots and traditions. 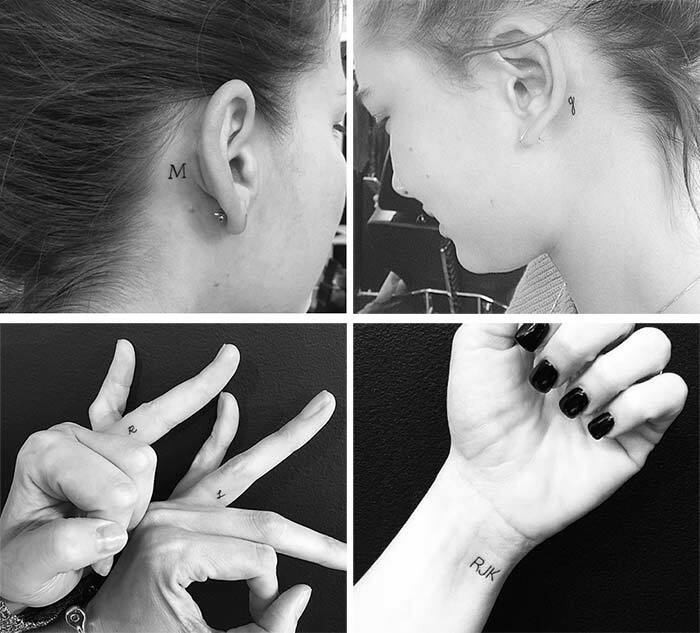 Whether you are somewhat narcissistic a person and yearn for extra identification affirmation, or are so tightly connected to someone that wants him/her to evermore rest on your body, initials tattoos just fit the bill. They can be designed in various ways and shapes accompanied by different motifs and objects. If you happen to watch a rabbit for several days in a scratch or if you have a rabbit pet, you might have noticed its rollicking and skylarking so joyfully. In African and Native American mythology this emotional and fluffy animal is dubbed as a trickster, always playing tricks on hunters and heroes. Hence, with a rabbit tattoo on you, you might give away yourself as a dealer-wheeler character. Rabbit is also a symbol of fertility, prosperity and bonanza. Here you can let your imagination free, but think twice before imprinting a slogan for your whole life. Maybe your long-standing tattoo “Absence makes the heart grow fonder’ is functioning in no way for your present life situation and you dream of getting it removed and writing a new one: “Out of sight, out of mind.’ If that’s you, you can always try tattoo removal in New York.